Who surrendered his soul to his Creator yesterday evening, Sunday 05/06/16, moments after the Islamic Ummah entered the month of the Qur’an Al-Kareem, the blessed month of Ramadan. He (may Allah’s mercy be upon him) loved the Book of Allah Ta’Aalaa immensely, the love of the sincere active believer. And he (may Allah’s mercy be upon him) sweet and pleasant in his speech, a key to the minds of men, creative in his discussion and a distinguished Islamic personality in his mentality and disposition. We ask Allah Subhaanahu to bestow upon His wide and abundant mercy, and to enter him into His gardens of paradise, in the highest Firdaus with the Prophets, truthful, martyrs and righteous, and they are the best company. 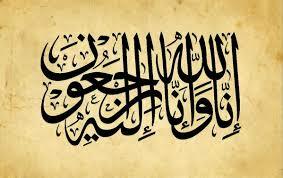 We also ask Allah Ta’Aalaa to grant us and his loved ones’ patience, solace and the best condolence.